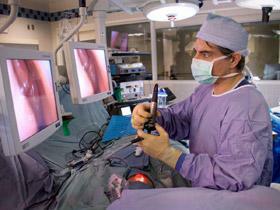 PITTSBURGH, PA--(Marketwire - May 31, 2007) - For the past decade, surgeons at UPMC and the University of Pittsburgh School of Medicine have pioneered a minimally invasive neurosurgical technique known as the Endoscopic Endonasal Approach (EEA). For certain conditions, this procedure uses the nose as a pathway to perform neurosurgery in adults. Now, a first-of-its-kind study published in the Journal of Neurosurgery: Pediatrics suggests endoscopic brain surgery has the potential to be safer and often more effective than conventional surgery in children with certain life-threatening conditions. We invite you to join us for an important Webcast discussion with the authors of this paper, Amin Kassam, MD, and Carl Snyderman, MD, who are working with Children's Hospital of Pittsburgh of UPMC to give kids hope they never had before. Join us, June 14, 2007 at 8 a.m. as Drs. Kassam and Snyderman present "A New Path to Brain Surgery; Endoscopic Endonasal Approach."